Cameron Mitchell must go undercover inside the deadly Lucian Alliance to prevent his teammates from becoming casualties of an Alliance civil war. The Odyssey drops out of hyperspace, investigating a reported second Ori Supergate. On board, Lt. Colonel Samantha Carter notes only the presence of neutron star powerful enough to disrupt Odyssey‘s systems. Immediately ambushed by three Ha’tak ships, Odyssey is forced into a minefield where the ship is extensively damaged. The ship’s commanding officer, Colonel Paul Emerson, radios Stargate Command and informs General Hank Landry of the ruse — as Odyssey is boarded. Though they have telemetry from the emergency transponder, Landry has no way to mount a rescue. Daedalus is in the Pegasus Galaxy. As Lt. Colonel Cameron Mitchell, Daniel Jackson, and Vala Mal Doran consider options, Teal’c advises that Bra’tac is pursuing the source of the false intel. But the Jaffa nation is in disarray. It will be days before a Jaffa vessel could arrive. Vala volunteers to get them a ship. Dubious, Landry accepts. Carter awakens in the hold. Emerson reports they were towed out of the minefield. Members of the boarding party come for Carter, taking her and Emerson to Anateo — part of the Lucian Alliance. He wants Carter to disable the ship’s subspace beacon, which is broadcasting their location. She refuses, and Emerson orders her not to cooperate. Solek, Anateo’s lieutenant, shoots Emerson in the heart and kills him. Aboard the run-down cargo ship that Vala has procured, she, Teal’c, Mitchell, and Jackson track the Odyssey‘s transponder to a small planet, which Vala recognizes as a former Goa’uld shipyard. Freed human slaves with ties to the Lucian Alliance have converted it to a space ship chop shop. Worried about another ambush, Mitchell allows Vala to take Jackson along when she meets Borzin, her contact. Borzin has the Odyssey transponder (black box). Mitchell and Teal’c, on their cargo ship, listen in as the device plays back the moments that resulted in Emerson’s death. Borzin turns Vala and Jackson over to Solek. When Borzin, Jackson, and Vala disappear, Mitchell and Teal’c return to the S.G.C. to brief Landry. Angry, Landry instructs Teal’c to spread the word that he wants to talk to the head of the Lucian Alliance. Stalling on repairs, Carter is with Anateo when Jackson and Vala are brought on board. He is upset that only part of SG-1 has been captured. As he has Jackson and Vala taken away, they tell Carter it is part of a plan. She resumes her delaying tactics. Determined to act, Mitchell wants to infiltrate the Lucian Alliance by posing as Kefflin, a reclusive but loyal lieutenant to Netan, the Alliance leader. Since only Netan recognizes Kefflin, Mitchell will use the Reole chemical, a memory-altering substance (“The Fifth Man,” “Summit”), to fool Netan into thinking he is his friend. Carter instigates a plan to retake the Odyssey. Although Solek suggests presenting the Odyssey to Netan, Anateo believes that having the Odyssey and SG-1 will prove his leadership skills and allow him to unseat Netan. On Netan’s mothership, Mitchell refuses to be searched before meeting Netan. He uses this as a way of injecting Netan with the Reole chemical. Glad to see his “friend,” Netan and Kefflin discuss strategy. Kefflin has come about Odyssey. He wants its technology. Teal’c, listening abroad a cloaked cargo ship nearby, is exposed when the cloak dissolves. He is taken aboard Netan’s ship. As Kefflin, Mitchell must allow Teal’c to be beaten for a short while. Promising to extract information, Mitchell orders everyone out of the cell so he can pretend to continue the torture. Mitchell is ready to abandon the ruse, but Teal’c keeps him on mission as they haven’t yet learned Odyssey‘s location. Carter continues her repairs and manages to open a door on the ship, freeing Jackson and Vala. One of Anateo’s men finally realizes something is going on — just before Jackson and Vala zat him. At Netan’s table, Kefflin says Teal’c revealed details of the capture of Odyssey and Anateo’s betrayal. Annoyed that Netan has not consulted them and risks war with the Tau’ri, Gavos chides Netan — who responds by killing him. Netan’s leadership of the Lucian Alliance is falling apart, and he is desperately, brutally trying to hold on to it. When Anateo learns Jackson and Vala are missing, he threatens Carter. Before he can kill her, Vala accesses the ship’s transporter system and beams him into space. The freed crew immediately starts repairs as Odyssey has no working shields, no weapons, no communications, and no hyperdrive. Netan is about to kill Teal’c when Tenat (“The Ties That Bind”) brings news of Odyssey. Tenat has encountered Mitchell before and recognizes him, but does not blow his cover. As Netan orders them to Odyssey‘s location, Mitchell offers Tenat a deal and tags him with the Reole chemical. Freed, weary of torture, Teal’c beats a captor until Mitchell calms him down. The pair escape to Tenat’s mothership before it turns to follow Netan’s ship. Jackson is in command of the bridge as Carter and Vala work on the hyperdrive. Major Marks reports two motherships have dropped out of hyperspace. Carter tells Jackson to stall. Netan demands surrender and Jackson agrees, but suggests boarding will be difficult due to the ship’s extensive damage. Because of the chemical, Tenat sees Mitchell as Netan. Mitchell orders him to fire on the other mothership. Teal’c hails Odyssey, asking for transport. He and Mitchell beam aboard Odyssey as Tenat realizes he has been duped. Netan destroys Tenat’s ship. Vala jams a crystal into the array. With its hyperdrive restored, Odyssey escapes. Carter repairs the long-range communications and reports they are homeward bound — and that they have effectively declared war on the Lucian Alliance. VOTE! 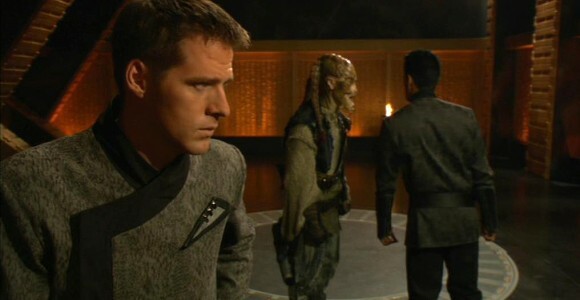 How would you rate SG-1's "Company of Thieves?"